Termites! They can find wood anywhere – but they don’t like teak. A friend of mine had a teak wood house, but her kitchen cabinets were not built of teak. The termites found their way up over the concrete base (built to keep them out!) under the teak wood wall, and into the kitchen at the back of the cabinets and proceeded to munch away until finally there were so many of them that the sound alerted my friend! I have had a ceiling fall down on me – the termites had chewed through the wood frames of the ceiling panels! 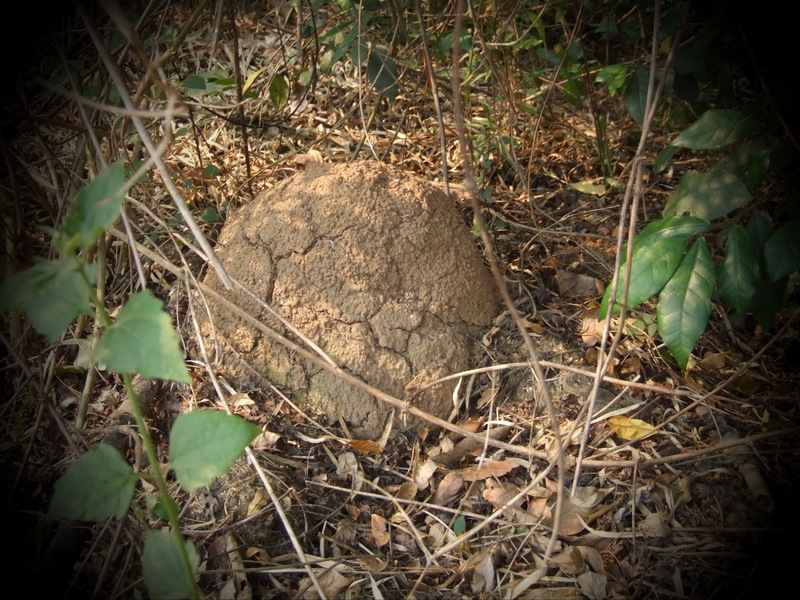 A termite mound at the bottom of the garden, about 50 cm high. What to do? Well, use as little wood as possible and use teak. But teak must be about the most expensive wood there is…. About a half hour drive away along a lovely road through the jungle by the side of the River Ping, there is a shop that sells second hand teak. It is run by a woman who used to sell pork in the market, but switched to buying old teak houses (many Thais prefer to have modern concrete houses) and breaking them up and selling the wood. So this is where I do my wood shopping. Not only pieces of wood for window and door frames, but even the windows and doors themselves. 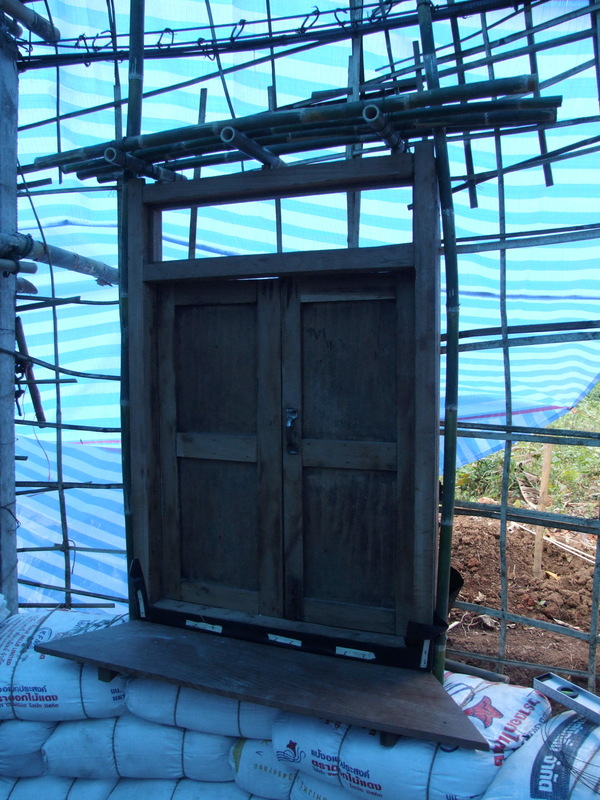 Old teak window sitting on rice-husk-bags, set in a bamboo frame attached to the ‘bird cage’. 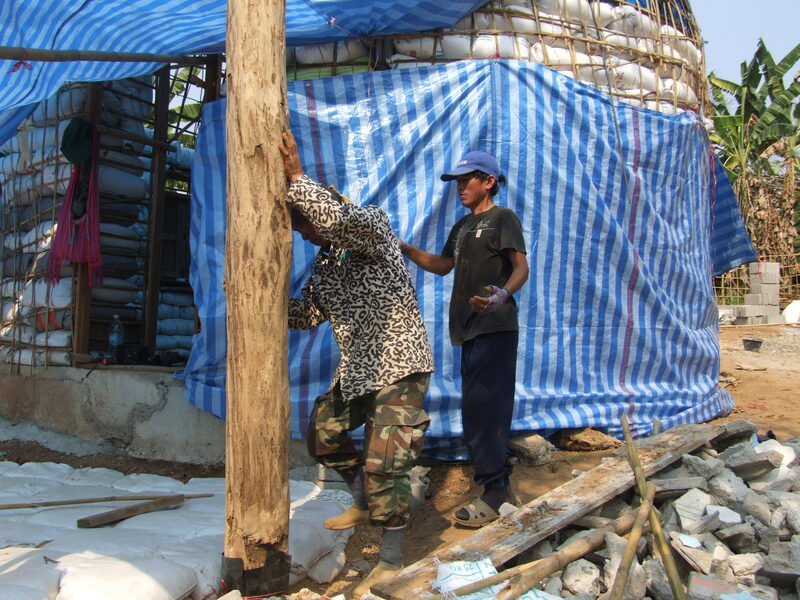 After the windows and doors are attached to the bird cage the rice-husk-bags continue up the walls. Then a point is reached where the dome begins to lean in. The bags, though not heavy in comparison to earthbags, were heavier than I was happy with to be attached to the roof, with gravity pulling them down. So volunteer Su Lupasco Washington designed a way of folding a sausage-like bag one third the thickness of our regular bags. 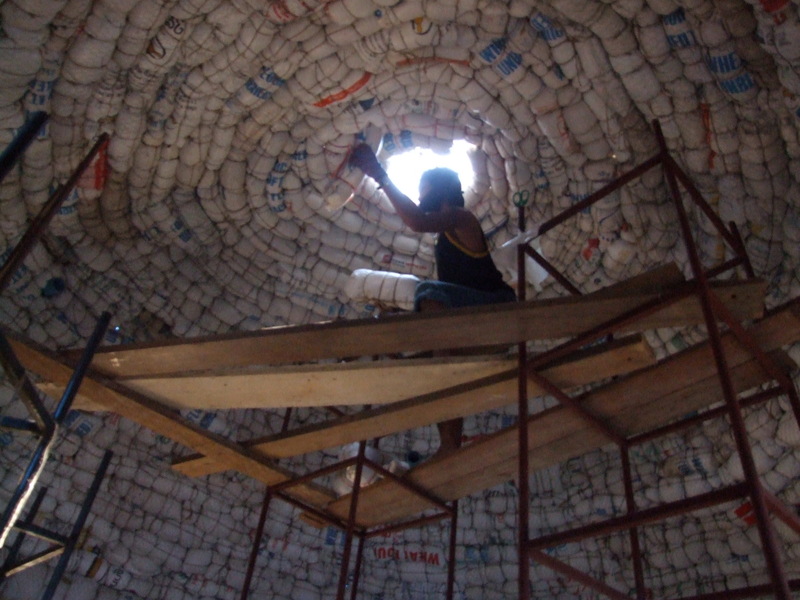 The bags continued up into the dome and finally covered the inside of the whole structure – and the temperature inside the dome immediately dropped! The last ‘sausage’ bags going up into the dome. Su also wove some bamboo shelves which will be covered with cob. 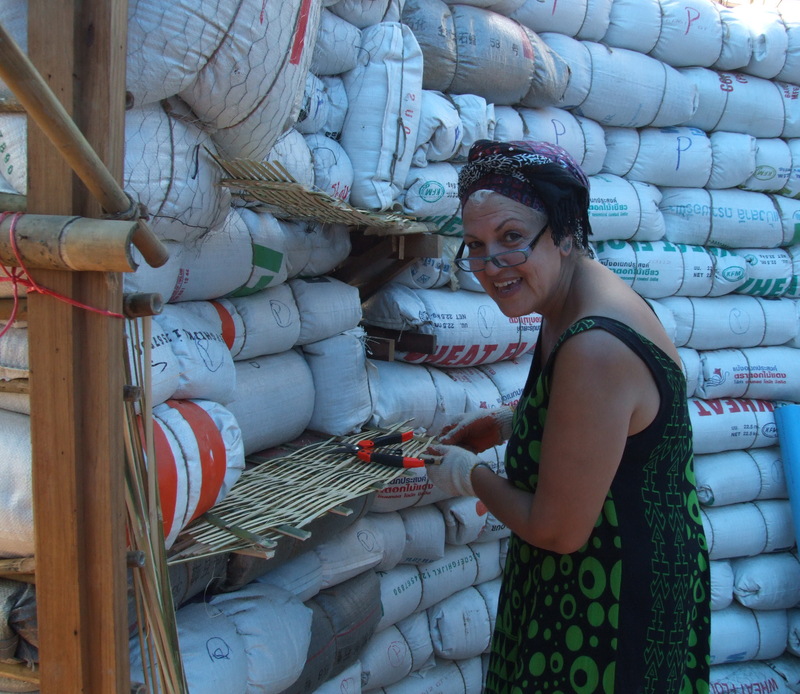 Su Lupasco Washington weaving bamboo shelves. Outside the front door of the dome we made a porch, the perfect place to sit and admire the view of the mountain, Doi Chang Dao. The roof of the porch, formed by an extended eave from the dome, will be balanced on two lovely old teak tree trunks. Setting an old teak post into position on what will be the porch. 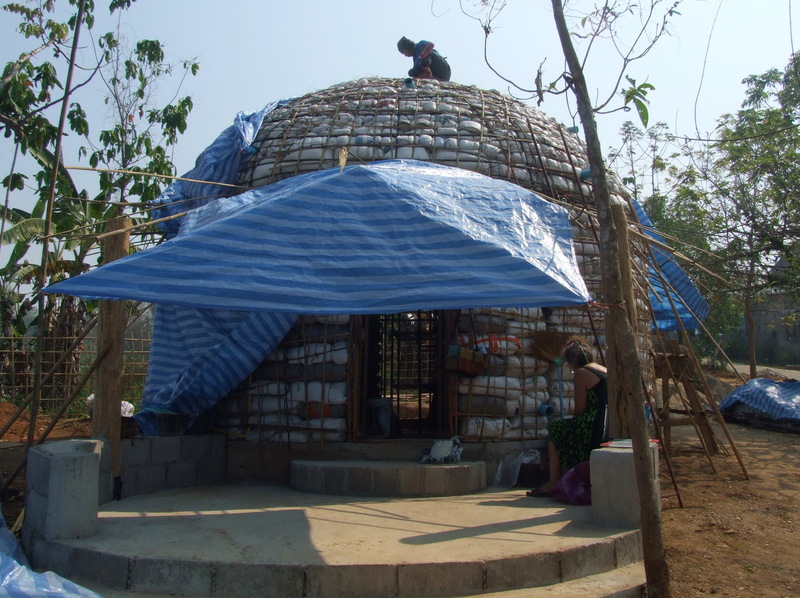 In the photo above you can see that part of the foundation for the porch is made from earthbags. The porch becomes a reality. The step up from the porch into the dome is Su’s! She created a fabulous mosaic in blue, and we shall name the dome ‘Blue Moon’. 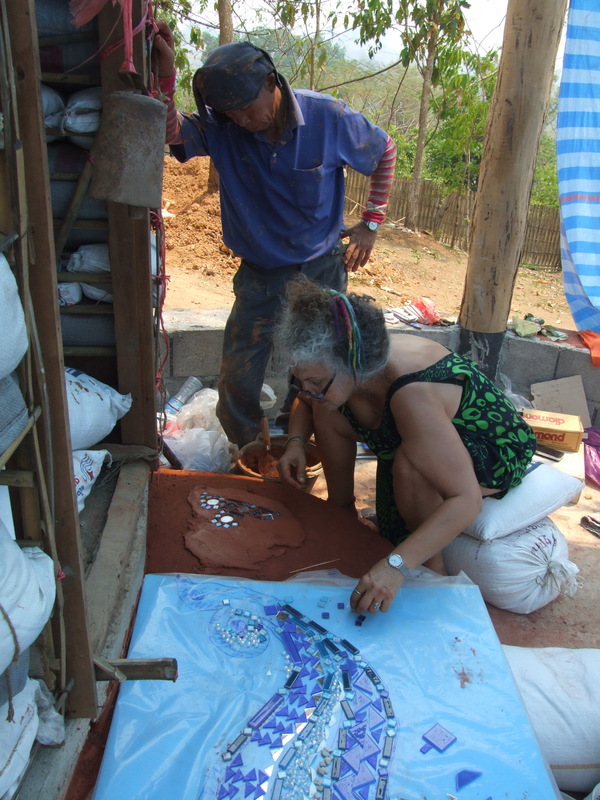 Su transferring her design onto the step, piece by careful piece. And back at home two new additions, kittens Widget and Sophia. 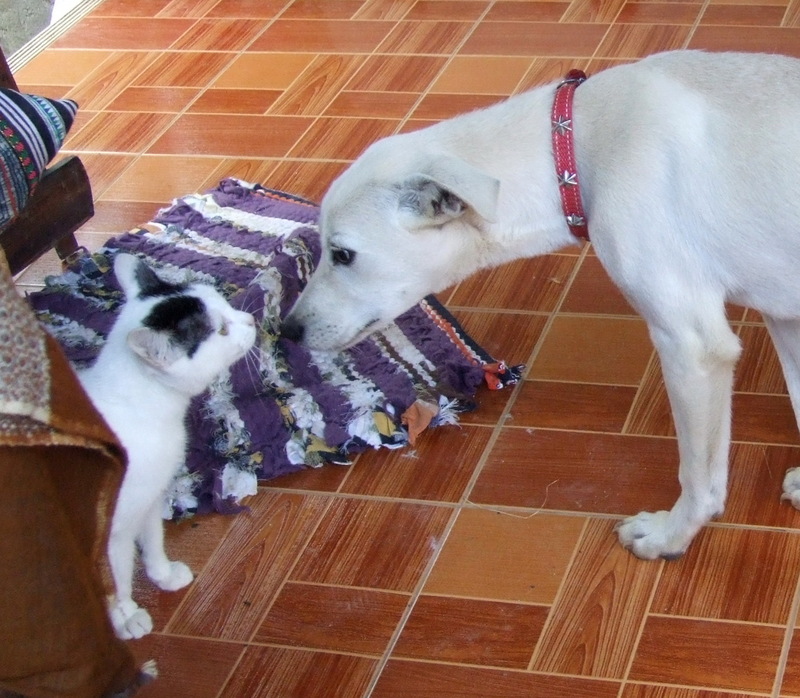 Toni and Widget tentatively checking each other out. Next Blog – finally – we get to play with mud! Yes never underestimate the termite! So you are using bags of rice hulls only? Do you tamp them in place? Are you applying them over/under a duper structure? Our bag work was straight up super adobe but our infill is about 70% rice hulls and some of that is in burned rice hulls which seems to keep down termite infestation. Do you soak your bamboo I’m borax? Am told If you don’t there is a high probability of it being infested with bugs which will cut useful life hugely. We are starting to hang the drapes and curtains which Yaya’s mom insisted on sewing by hand for us…so sweet a gesture… The material is pakoma (sp?) Material. Yes its rice husks only in the bags, with a bit of a tamp. As the bags are not holding the structure together (as with earthbags) they do not need to be tamped too much, just to get a good shape. The structure is held together with the ‘bird cage’. Re the bamboo, my understanding is that if it is within the earth structure it won’t be infested which is good as I hate chemicals. HOPE that’s true! When are you moving in and where can I see some pictures? Maggi, I can’t wait to visit! You are doing amazing stuff, I’m really in awe!